Well I'm back and I'm not alone. Ooooo doesn't that sound sinister? It's not I assure you. I've come back to show you the completed project from that last post. The project didn't take all this time to finish, I'm just bad about getting photos to post here. So without any further ado... Here's Flora the Hedgehog. She's not your typical hedgehog, as I'm you sure you can tell. But I'm happy with how she turned out. 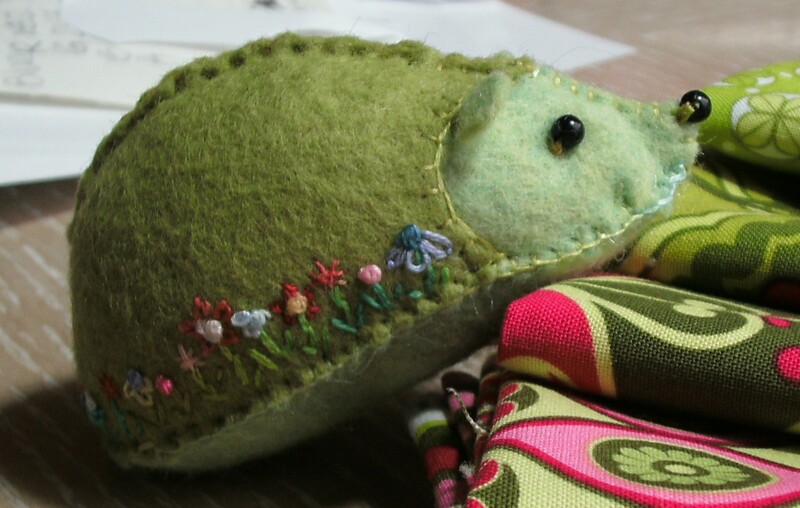 I created her to be a pincushion, although she hasn't been used in that capacity as yet. Mostly she coyly sits on the shelves above my sewing machine and watches as I sew. She's such a sweet young lass of a hedgehog. It's nice to have her keep me company. Miss Flora was kind enough assist in showing off the fabric that I used for my next project. I will admit that I already finished this project as well. It is a fabric bunting/garland using Patty Young Mezzanine fabric, that I purchased from Fabric Closet on Etsy. I didn't use any specific pattern. Just sort of winged it. I'm going to use this one as part of our Christmas decorations this year. I had a lot of fun making it, and already have my eye on some other fabrics that I would love to use. Maybe a garland from either this fabric or this one. I'm really drawn to the second one since those are the colors that are more prevalent throughout my home. Yet the first one, Paula Prass' Flights of Fancy collection, has had me intrigued for some time. I love the Air Mail print in the collection. I have so many other projects on the horizon I'll have to just move those to the bottom of the projects list for now. Today I thought I would share a small project that I am beginning to work on. 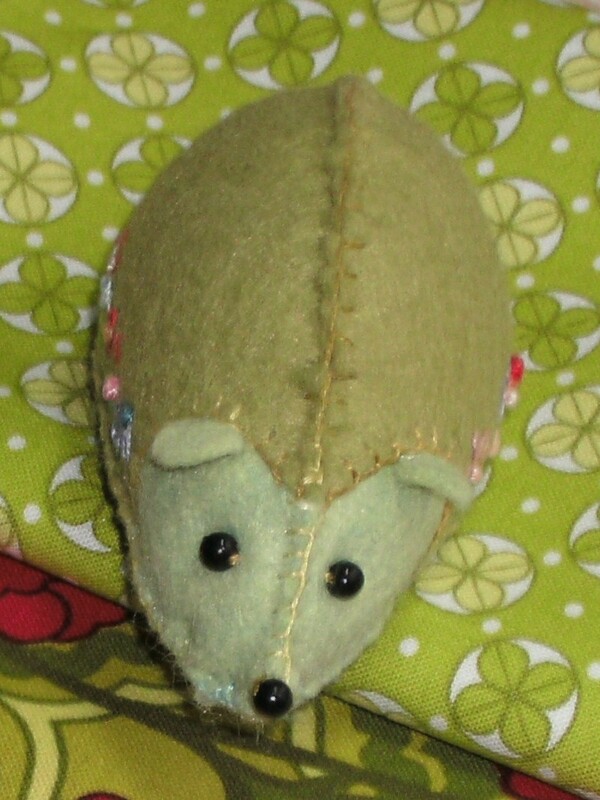 It's a pincushion. 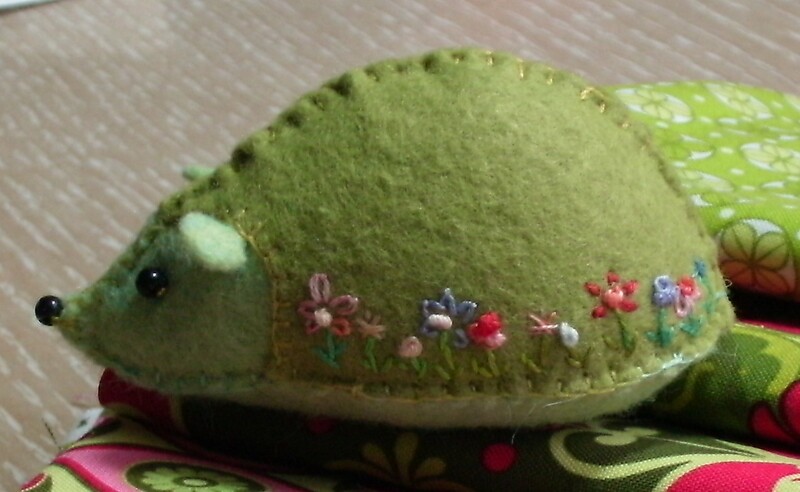 I won't tell you what the pincushion is gonna be. Suffice it to say that is a small creature. And no the color I chose is not indicative of the actual creature. I have truly taken creative liberties here. I am using some felt I purchased from The Daily Pincushion. 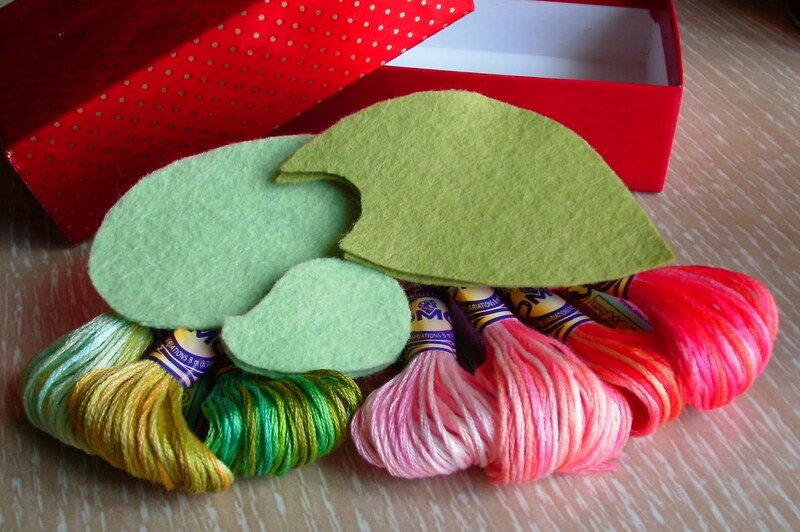 The felt is just lovely and is some of the nicest I have worked with. I want to order this set next. I'm going to use it to make some decorative mittens for the wee ones for Christmas instead of hanging stockings. You know in my free time. I have been busy. I swear I have, and here are some photos to show you. They aren't the best photos. But maybe if you squint a little and stand back from the monitor in a dimly lit room, they might improve. This is the second quilt top I have been working on. I read other peoples blog on how they complete these great quilts in a week and I'm lucky if I can sew for about an hour in a week. So sorry for the slow progress. 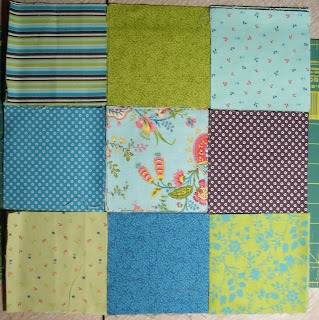 I realize in this photo the squares aren't sewn yet, but play along and imagine they are. This shows the center square with the blue floral. 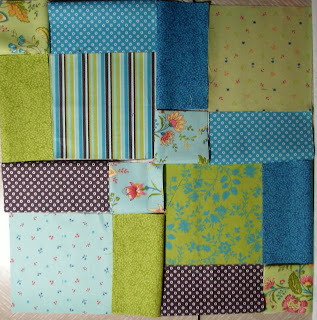 I also did this layout with green floral square as the center. Then I did something that was a wee difficult at first. I cut them in fourths, through the center of the block. I know, I know you are thinking that this is very clever, and I will agree with you, but it wasn't me being clever. I found it on another blog. Which one? I'm glad you asked. The Moda Blog. There again, play along, I know they aren't sewn, but it at least gives you an idea of what I'm doing. Hopefully I will have better photos to show you soon. Stay tuned! t is not very often that I have the opportunity to rave about something so surprisingly wonderful...but here I go. Miss Darcy had a cool contest a bit ago for a sampler of some hand lotion. I left a comment, and, to be honest, forgot about it. Well Darcy contacted me and let me know that I was one of the winners. Woo Hoo! I have to keep stopping to smell myself. How crazy is that! And I have a strange chemical make up. Certain scents go all sorts of wrong on me. Take something like Calvin Klein's One fragrance, for instance, it smells like decomposing watermelon on me. Or Elizabeth Arden's Red Door, decomposing watermelon. Ah yes and let's not forget the wonderful reaction you get when I wear something like Giorgio. Yup you guessed it...decomposing watermelon. So when I find a scent that does not do that I'm thrilled. (snifffff) And you might ask what is this amazing hand lotion that I can't seem to stop singing the praises of called ...... Happy Hands Lotion. And mine are. If you haven't heard of or tried her lotion before, please go over and check them out. You can purchase sample packs to try out. Which I think is a great idea. And if you have tried them before then you know exactly what I mean about the feel and smell of this lotion. Now I am going to play devils advocate here. Am I saying this is the best lotion I have ever tried? No. Because I haven't tried all the lotions that I probably will in my life. But I am saying that I am highly impressed and very pleased about how this lotion feels and smells. So much so that I am going to go over to Los Gringos and purchase some right now. It's interesting how a craft can take over your life, kind of sneaky like. I'm talking about quilting. For some reason it seems to be the craft my mind wanders to, when my mind has the chance to wander at all. I'm not sure if it's because I have my sewing machine out now and can see it. Or if it's a visual thing. 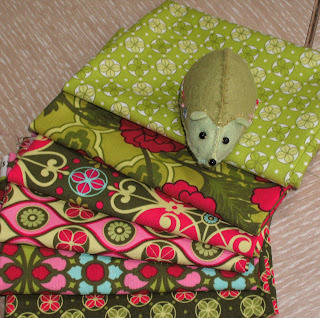 Reading blogs and seeing the quilts that have been made can be very inspiring for me. Or if it's the newness of the craft. I'm just not sure what it is. But I seem to be smitten with it. I do tend to lean more towards the simpler quilts like this or like this. The more involved quilts are impressive. Yet when I look at them I just end up thinking "I gotta cut all those pieces" Ugh! Remember the black, red and cream quilt that I started with? Well of course you do! Anyways, I'm at the point in which you sandwich the backing on and start the actually quilting process. (Pause, blink, blink) Yeah well it's kind of been at that stage for a wee bit of time now. Yes, I admit it, I'm intimidated by the process. The whole getting the sandwich thing done, that I'm ok with. It's the whole machine quilting thing that kind of makes me pull up short. So right now it sits on the back of my couch waiting for me to complete it. Yet the intimidation I feel about the machine quilting has not stopped me from carrying on creating in this craft. I have already started on another quilt top. And I have about 4 others planned.